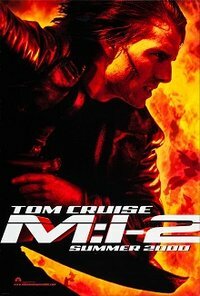 Mission: Impossible 2 (also abbreviated as M:I-2) is a 2000 American action spy film directed by John Woo and starring Tom Cruise, who also served as the film's producer. It is the second installment in the Mission: Impossible film series. In the film, Ethan Hunt is recruited by the Impossible Missions Force (IMF) to find and destroy a dangerous biological weapon called "Chimera" from a rogue IMF agent named Sean Ambrose with the help of his new girlfriend, Nyah Nordoff-Hall. Mission: Impossible 2 was released in theaters worldwide on May 24, 2000. It grossed more than $546.4 million worldwide, becoming the highest grossing film of 2000. Reviews were mixed; praise was directed at Tom Cruise's performance and the action sequences, but the plot and dialogue were criticized. A sequel, entitled Mission: Impossible III, was released in May 2006. This webpage uses material from the Wikipedia article "Mission%3A_Impossible_2" and is licensed under the GNU Free Documentation License. Reality TV World is not responsible for any errors or omissions the Wikipedia article may contain.